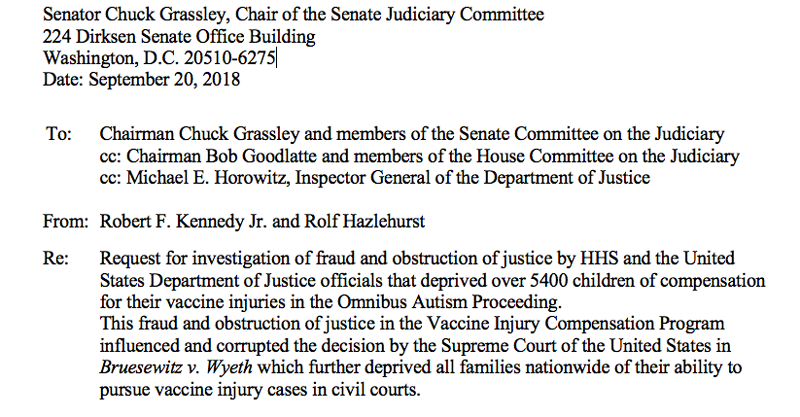 Re: Request for investigation of fraud and obstruction of justice by HHS and the United States Department of Justice officials that deprived over 5400 children of compensation for their vaccine injuries in the Omnibus Autism Proceeding. 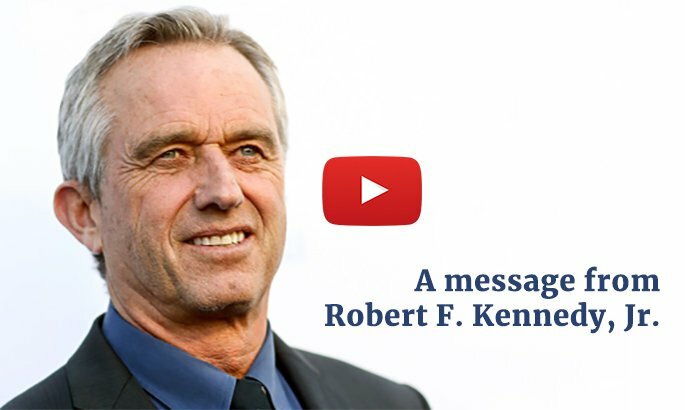 This fraud and obstruction of justice in the Vaccine Injury Compensation Program influenced and corrupted the decision by the Supreme Court of the United States in Bruesewitz v. Wyeth which further deprived all families nationwide of their ability to pursue vaccine injury cases in civil courts. We are writing to request an investigation into recently disclosed revelations about highly unethical and appallingly consequential official misconduct by Department of Justice (DOJ) officials while representing the Department of Health and Human Services (HHS) during the Omnibus Autism Proceeding (OAP) in the National Vaccine Injury Compensation Program (NVICP). The unethical acts by DOJ and HHS directly influenced the Supreme Court of the United States decision in Bruesewitz v. Wyeth, a decision that continues to adversely affect millions of vaccine-injured children. In 2007 and 2008, DOJ attorneys and HHS officials purposefully and maliciously deceived the NVICP, also known as “vaccine court”, in order to deny relief to 5,400 children whose injury claims threatened to bankrupt the vaccine program. In 1986, Congress passed the Vaccine Injury Compensation Act (VICA) giving immunity to pharmaceutical companies for injuries caused by vaccines and creating a no-fault trust fund administered by HHS from which the Court of Claims would “quickly and generously” award petitioners who suffered vaccine injuries. The immunity provisions of VICA made vaccines enormously profitable. This created a gold rush by pharma to add new vaccines to the CDC’s childhood schedule. In the decade that followed VICA, new infant vaccines were added to the schedule coterminous with a cascading epidemic of chronic neurodevelopmental disorders including autism which many parents, scientists and doctors attribute to vaccines. As the rate of autism rose catastrophically from 1 in 2500 children in 1985 to 1 in 250 by 2002, lawyers were filing class action lawsuits in civil courts, alleging that a mercury preservative in certain vaccines was contributing to the autism epidemic. They argued that their claims should not be subject to the Vaccine Act procedural hurdles since the preservative was not a necessary component of the vaccine—in legal parlance—an unnecessary design defect. In 2002 Leroy v. HHS established, however, that thimerosal was vaccine-related, so that thimerosal/autism cases did have to proceed through the vaccine court. Following the Leroy decision, a “crushing wave” of over 5,400 thimerosal related autism claims flooded into the vaccine court, leading to the creation of the Omnibus Autism Proceeding in 2002. The Omnibus Autism Proceeding, under a special master, would “determine whether thimerosal containing vaccines and/or MMR vaccines can cause autism or similar disorders and if so under what conditions.” In an analogy to mass tort litigation, the special master chose six bellwether “test” cases from the 5,400 to serve as surrogates for the remainder. Three special masters would hear general and specific causation evidence in those six cases. If the claimants in any of those test cases could show that his or her autism was caused by vaccination, then the decision in the successful test case would be the basis for compensation for the remaining 5,400 claimants in vaccine court. The potential value of those claims exceeded $100 billion, an amount that would have bankrupted the program many times over, threatening to cause the Vaccine Act—with its attendant immunities to pharmaceutical companies—to collapse. HHS’s DOJ lawyers were therefore under pressure to win all six cases at all costs. Beginning in 2007, three special masters heard six test cases which determined the fate of almost all of the remaining 5,400 cases. The vaccine court heard the first case, Cedillo v. HHS in June of 2007. Hazlehurst and Snyder were heard in the fall of 2007. Poling v. HHS was slated to be one of the remaining three test cases for HHS but crooked DOJ attorneys secretly conceded and sealed it in 2007 when they realized they could not win it. By their acts, they fraudulently deprived 5400 petitioners of their rightful relief. The special masters heard the remaining cases, Meade, Dwyer and King in spring of 2008. During the Omnibus Autism Proceeding, Department of Justice attorneys Vincent Matanoski and Lynn Ricciardella acted in concert with their client, the Department of Health and Human Services, to intentionally misrepresent the opinion of their own expert witness, and to willfully conceal from the vaccine court and petitioners critical material evidence showing how vaccines may cause autism. The same DOJ attorneys subsequently intentionally mislead the United States Court of Appeals for the Federal Circuit. As a result fraud was ultimately perpetrated upon the Supreme Court of the United States. The Department of Justice, representing HHS, used this opinion as “general causation evidence” to deny compensation to almost every vaccine-injured child whose case was in the OAP. However, after the report was written, but before the DOJ lawyers used it as evidence, Dr. Zimmerman specifically advised the DOJ attorneys representing HHS that his written opinion was a case specific opinion pertinent to Michelle Cedillo only. Dr. Zimmerman said that he did not intend his opinion to be a blanket statement as to all children and all medical science. Dr. Zimmerman further advised the DOJ that in his opinion vaccinations could, and in at least one of his patients, (Hannah Poling) did cause autism. Most importantly, he explained to DOJ how vaccines can cause autism in a subset of children with underlying mitochondrial disorder. Dr. Zimmerman’s clarification of his opinion panicked DOJ attorneys. Matanoski and Ricciardella realized that, if Dr. Zimmerman’s true opinion became known to the petitioners, it would open the floodgates to all 5,400 autism cases and collapse the Defendants’ scheme to deny the autism link and keep claimants out of courts. That weekend a DOJ attorney called Dr. Zimmerman and told him that he would no longer be needed as a witness for HHS in the Cedillo case or elsewhere in OAP. According to Zimmerman, “I believe that I was not called to testify in the Cedillo case because I told [the DOJ lawyers] I think there are rare exceptions, like Poling, and therefore I was not asked to testify.” The following Monday, June 18, 2007, DOJ attorney Vincent Matanoski informed the Special Master that he would not call Dr. Zimmerman to testify. Instead of giving plaintiffs the benefit of the doubt, as the VICA statute requires, HHS and its attorneys were now actively conspiring and scheming to prevent brain injured children from obtaining their lawful remedies. The same DOJ lawyers who submitted and relied upon Dr. Zimmerman’s written expert opinion in Cedillo secretly conceded Poling v. HHS. They then objected to the release of the information in Poling, in order to conceal this concession and the evidence of causation from other petitioners and the public. HHS and DOJ then misrepresented Dr. Zimmerman’s opinion as evidence in the remaining OAP test cases to assert that there is no scientific basis that the vaccines in question cause autism despite the fact that the DOJ knew that Dr. Zimmerman actually believed that certain vaccines could cause autism in a subset of children who suffer from a possibly common pre-existing mitochondrial dysfunction. It is important to pause here and understand that the OAP’s peculiar rules allowed any evidence concerning the “general causation issue” entered in one test case to be considered as evidence in the other test cases and the remaining 5,400 cases. The DOJ attorneys were therefore able to keep Zimmerman’s expert opinion in Cedillo in evidence and use it as general causation evidence against the petitioners in all subsequent cases. This, of course, would be impermissible in a court of law. These petitioners had no right, nor opportunity to subject Dr. Zimmerman to cross-examination. Since there was no opportunity for cross examination, none of the petitioners against whom DOJ deployed his opinion were aware of Dr. Zimmerman’s opinion of how vaccines can cause autism. In the hands of the DOJ attorneys Dr. Zimmerman’s misrepresented opinion became a powerful weapon that denied compensation to almost every one of the 5,400 vaccine-injured children whose cases were in the OAP. Nor were the Special Master or judges ever aware of Dr. Zimmerman’s true opinion when they issued the enormously consequential decision. On June 6, 2007, the testimony in Cedillo v. HHS concluded. Hannah Poling presented a daunting problem for Defendants and other government officials who were determined to block the potentially ruinous 5,400 claims. Hannah’s father was a brilliant young neurologist completing his residency at Johns Hopkins School of Medicine. Her mother was a nurse and lawyer. Hannah’s parents had scrupulously and meticulously documented, with film and extensive medical records, the regression into autism of their exceptionally talented and perfectly healthy daughter following an MMR vaccination and at least one or more thimerosal-containing vaccines. Hannah Poling literally regressed before the eyes of some of the top medical scientists in the country. Worst of all for the government, Dr. Zimmerman and his highly-regarded colleague, Dr. Richard Kelley, agreed to be expert witnesses for the Polings. In a November 30, 2007 letter, written by Dr. Zimmerman to Cliff Shoemaker the attorney for the Polings, after HHS secretly conceded the Poling case, Dr. Zimmerman explained, in concise and compelling detail, how post-vaccination fevers and immune stimulation can cause autism in a subset of children with underlying mitochondrial disorder. Dr. Zimmerman opined that Hannah had a previously undetected and possibly otherwise harmless mitochondrial disorder that made her susceptible to vaccine injury and that her autism was triggered by a vaccine-induced temperature spike. This two-page letter (attached as exhibit 3) is critical to understanding how vaccines cause autism. Subsequent science supports Dr. Zimmerman’s opinion. Published peer-reviewed studies suggest that up to 40% of autistic children have a mitochondrial disorder like Hannah Poling. Dr. Zimmerman’s new revelations threatened to open the vaccine court floodgates to children with autism. Under the OAP rules, a victory by or a concession to any of the bellwether petitioners including Hannah Poling would be a basis for compensation for the remaining 5,400 cases pending in the OAP. To block the public from learning of Zimmerman’s true opinion, the DOJ lawyers Vincent Matanoski and Lynn Ricciardella secretly settled Hannah’s case—for lifetime payments that could exceed $20 million. Working with Defendants, the two DOJ lawyers procedurally concealed the record which resulted in it remaining confidential. As a result, another much weaker case became the bellwether to the OAP. In the remaining trials, HHS and DOJ continued to fraudulently misrepresent Dr. Zimmerman’s opinion as evidence in the OAP despite the fact that Dr. Zimmerman advised the DOJ attorneys and HHS that his opinion in Cedillo was case specific and was never intended to be a blanket opinion regarding all children and all medical science. By making the strategic concession in the Poling case, HHS and DOJ again prevented Dr. Zimmerman from taking the witness stand, where he would have conveyed his opinion that vaccines could cause autism in children with mitochondrial dysfunction. Despite Dr. Andrew Zimmerman’s face to face direct clarifications, the DOJ attorneys baldly lied to the special master, claiming that Dr. Zimmerman, believed that “There is no scientific basis for a connection between measles, mumps and rubella (MMR) vaccine or mercury (Hg) intoxication and autism… there is no sound evidence to support a causative relationship with exposure to both, or either, MMR and/or Hg.” in all children. In my opinion, the statement by Mr. Matanoski during his closing argument regarding my expert opinion was highly misleading and not an accurate reflection of my opinion for two reasons. First, Mr. Matanoski took portions of my opinion out of context. My opinion as to Michelle Cedillo was case specific. I was only referring to the medical evidence that I had reviewed regarding her. My opinion regarding Michelle Cedillo was not intended to be a blanket statement as to all children and all medical science. Second, I explained to Mr. Matanoski and the other DOJ attorneys who were present that there were exceptions in which vaccinations could cause autism. In my opinion, it was highly misleading for the Department of Justice to continue to use my original written expert opinion, as to Michelle Cedillo, as evidence against the remaining petitioners in the OAP in light of the above referenced information which I explained to the DOJ attorneys while I explained to the DOJ attorneys while omitting the caveat regarding exceptions in which vaccinations could cause autism. These DOJ and HHS attorneys not only intentionally misrepresented Dr. Zimmerman’s expert opinion to the special master, but they also unethically concealed his opinion, from the petitioners. DOJ and HHS conspired and acted to block Dr. Zimmerman’s opinion in Poling from being released to the public. Despite a “Motion for Complete Transparency” to the vaccine court by Hannah Poling’s parents to release her records, including Dr. Zimmerman’s testimony, to the public, the DOJ opposed the motion. That secret concealing of the government’s Hannah Poling concession which resulted in the substitution of a weaker case was the bait and switch that allowed DOJ to get away with representing to the special master, and subsequently, the Sixth Circuit, that no link had been found between vaccines and autism in any of the six test cases. That representation was fraudulent. Respondent must file a report setting forth a full and complete statement of its position as to why an award should or should not be granted. The Poling v. HHS Rule 4-c report is largely based on the medical records and opinions of Dr. Zimmerman, who the DOJ attorneys reference nine times in the eight-page report as well as the medical records and written expert opinion of Dr. Kelley. The analysis portion of the Poling v. HHS Rule 4-c report states: Medical Personnel at the Division of Vaccine Injury Compensation, Department of Health and Human Services (DVIC) have reviewed the facts of this case, as presented by the petition, medical records, and affidavits. After a thorough review, DVIC has concluded that compensation is appropriate in this case. DOJ attorneys Vincent Matanoski and Lynn Ricciardella wrote and submitted the Rule 4-c report. Both of those DOJ attorneys represented HHS in Cedillo, Hazlehurst and Poling. It is important to understand that 42 U.S.C. 300aa-11(c)(1)(C)(ii) is not a pure “Table Injury” under 42 U.S.C. 300aa-11(c)(1)(C)(ii) as HHS and DOJ later fraudulently claimed. The requirements of proof as to causation under 42 U.S.C. 300aa-11(c)(1)(C)(ii) is by a preponderance of the evidence, the same level of proof required in a civil action in a court of law. HHS and DOJ never intended for the American people to see the Rule 4-c report or to know about the Poling v. HHS concession. And those DOJ attorneys fought hard to keep the cataclysmic evidence secret. After the Poling Rule 4-c report was leaked to the press, Hannah Poling’s parents filed a MOTION FOR COMPLETE TRANSPARENCY OF PROCEEDINGS, requesting that HHS’s concession and the details of her case officially be made public. HHS and DOJ opposed the motion. The special master deferred ruling on the motion for 60 days to allow the parties to resolve the issue. The issue has never been decided. On October 15, 2007, the Hazlehurst v. HHS hearing began. As previously explained, all general evidence in Cedillo v. HHS automatically became general causation evidence in Hazlehurst v. HHS. Despite Dr. Zimmerman advising the DOJ attorneys that his opinion in Cedillo was case specific and was not intended to be a blanket opinion regarding other children, the DOJ lawyers nevertheless submitted his opinion as the key expert evidence in Yates’s trial. DOJ intentionally and fraudulently misrepresented Dr. Zimmerman’s opinion in Cedillo to the special master saying that Dr. Zimmerman was of the opinion that “There is no scientific basis for a connection between measles, mumps and rubella (MMR) vaccine or mercury (Hg) intoxication and autism….., there is no sound evidence to support a causative relationship with exposure to both, or either, MMR and/or Hg.” Thanks to DOJ’s act of conceding and sealing the Poling case, petitioners in the Hazlehurst case had no idea that DOJ was misrepresenting Dr. Zimmerman’s opinion and that his complete opinion was that vaccines cause autism in a subset of children, like Yates, who suffer from an underlying mitochondrial disorder. Years later, Dr. Zimmerman and Dr. Kelley would both opine that Yates Hazlehurst was injured in the same manner as Hannah Poling. During the course of the hearing, Yates’ grandmother, Aud Hazlehurst, and his father, both testified that Yates was a patient of Dr. Andrew Zimmerman in 2002 at the Kennedy Krieger Institute at Johns Hopkins and that Dr. Zimmerman was aware that Yates’ regression into autism had begun with vaccine-induced fever in 2001. Neither Rolf Hazlehurst nor his family realized that Dr. Zimmerman was now of the opinion that vaccines can cause otherwise healthy children to regress into autism and this injury by post-vaccination fever and vaccine-induced immune stimulation was precisely the kind Yates had suffered. I have reviewed extensive genetic, metabolic and other medical records of William Yates Hazlehurst. In my opinion, and to a reasonable degree of certainty, William Yates Hazlehurst suffered regressive encephalopathy with features of autism spectrum disorder as a result of a vaccine injury in the same manner as described in the DOJ concession in Poling v. HHS, with the additional factor that Yates Hazlehurst was vaccinated while ill and after previously suffering from symptoms consistent with a severe adverse reaction. Despite knowing Dr. Zimmerman had clarified his original opinion, Matanoski, in an extraordinary example of chutzpa and shameful and fraudulent deceit stated, during his closing argument in Hazlehurst, that Dr. Zimmerman stood by his earlier expert opinion. “I did want to mention one thing about an expert, who did not appear here, but his name has been mentioned several times, and that was Dr. Zimmerman. Dr. Zimmerman actually has not appeared here, but he has given evidence on this issue, and it appeared in the Cedillo case. I just wanted to read briefly because his name was mentioned several times by petitioners in this matter. What his views were on these theories, and I’m going to quote from Respondent’s Exhibit FF in the Cedillo case, which is part of the record in this case as I understand it. The above referenced transcript is attached as exhibit 6. By intentionally misrepresenting Dr. Zimmerman’s opinion in Cedillo to the vaccine court, Vincent Matanoski committed fraud on the court. On February 12, 2009, almost a year and a half after the hearing in Hazlehurst v. HHS, the special masters released their decisions denying compensation to the first three test cases in the OAP. “As a pediatric neurologist with a particular research interest in autism and with considerable clinical experience with autistic children, Dr. Zimmerman opined that “there is no scientific basis for a connection” between the MMR vaccination, mercury intoxication, and autism. Cedillo Ex. FF at 2, 4 (Dr. Zimmerman’s report). The special master also relied heavily upon three fraudulent epidemiological studies (Verstraeten et al., 2003, Madsen et al., 2003 and DeStefano et al., 2004) ginned up by HHS officials specifically for the purpose of gulling the vaccine court. In recent years, the public has learned that all three of these studies were the product of outrageous fraud. Dr. Verstraeten has publicly denounced CDC’s campaign to represent his study as an exculpation of vaccines from the autism epidemic. His raw data, obtained by FOIA request, shows an 11 times risk of autism among children receiving high levels of mercury from their vaccines in the first month of life compared to children with no mercury exposure. Similarly, an author of the DeStefano 2004 study, Dr. William Thompson, has turned whistleblower and confessed that his CDC bosses ordered him and his fellow authors to destroy reams of data that revealed an outsized autism risk of 240% among black boys who received the MMR vaccine on time compared to those who did not. Finally, the Madsen 2003 study has now been exposed as junk science created by CDC officials. Its team leader, Poul Thorsen, is an international fugitive with indictments by the DOJ for 22 counts of wire fraud and money laundering while stealing $1 million in CDC autism research funds. Thorsen is on the HHS OIG Most Wanted List. Finally, the special master relied upon the 2004 IOM declaration which also largely relied on those three fraudulent studies. Because of the lack of discovery and procedural safeguards it would be years before the petitioners in those cases or the 5,400 claimants who had their petitions summarily dismissed would become aware of the fraud perpetrated by the HHS officials and DOJ attorneys. The vaccine court’s holding against compensation in the Hazlehurst case effectively denied compensation to almost every one of the 5,400 vaccine injured children whose cases were pending in the OAP. It should be noted that Mr. Matanoski was subsequently promoted and is currently Deputy Director, of the Constitutional and Specialized Torts Branch of the United States Department of Justice, where his responsibilities include oversight of Vaccine Act litigation. Matanoski’s fraud was part of a larger scheme to conceal from the public the outsized risks of vaccine injury and deny rightful relief to injured children. By 2009, when the OAP dismissal finally reached the Court of Appeals, the test case petitioners did not know that Poling was a potential test case, why it was conceded, the damning testimony of the government’s key witness, or the perpetration of fraud and obstruction of justice by DOJ and HHS. The Petitioners also knew nothing about the scientific fraud perpetrated by Dr. Poul Thorsen and Dr. Bill Thompson or CDC’s Verstraeten study cover up in the key studies relied upon by OAP special masters for the finding that vaccines cannot cause autism. In 2009, the United States Court of Appeals for the D.C. Circuit heard the Hazlehurst v. HHS appeal in which Yates Hazlehurst requested a remand. During oral arguments the Court of Appeals Judge asked the DOJ attorney about the developing science and medicine regarding the ultimate issue of whether vaccines can cause autism. The DOJ attorney, Lynn Ricciardella, stated that, “Well, there’s a lot to your question, Your Honor, but I would say at this stage—we’re not even at the stage where it’s medically or scientifically possible.” Ms. Ricciardella made the extremely consequential and profoundly fraudulent statement to the Court despite the fact that she had signed and submitted the Rule 4-c report conceding that Hannah Poling suffered autism as a result of a vaccine injury. Lynn Ricciardella was in possession of the opinions of Dr. Zimmerman, Dr. Kelley and other top medical scientists when she told the Court that whopper. The above referenced transcript from the Court of Appeals is attached as exhibit 7. When Ricciardella made her misrepresentation to the United States Court of Appeals she herself had procedurally covered up critical material evidence of how vaccines can cause autism including the expert opinions of Dr. Zimmerman, Dr. Kelley and other renowned experts, all of whom had submitted written opinions to DOJ and HHS that the vaccines can and did cause autism in the case of Hannah Poling. I also find, with a high degree of medical certainty, that the set of immunizations administered to Yates at age 11 months while he was ill was the immediate cause of his autistic regression because of the effect of these immunizations to further impair the ability of his weakened mitochondria to supply adequate amounts of energy for the brain, the highest energy-consuming tissue in the body. Although rare and, therefore, not usually captured in large epidemiological studies, autistic regression after immunization has occurred in at least 5 patients I have evaluated, of whom one was awarded compensation by the US vaccine court. The one case that was awarded compensation was Poling v. HHS. Ricciardella, who had worked diligently to keep the opinions of Dr. Kelley, Dr. Zimmerman and other world-renowned experts secret from the OAP petitioners and special masters, deliberately concealed them once again from the Appellate Court. Ricciardella’s misrepresentation to the Appeals Court judge resulted in the decision that would ultimately block generations of vaccine damaged autistic children from receiving their rightful remedies from the vaccine court. Roughly 100,000 American children are diagnosed with autism spectrum disorder each year. Since Matanoski and Ricciardella submitted and approved for entry the Rule 4-c report in 2007, roughly 1 million children have been diagnosed with autism. As a result of the fraud perpetrated by these attorneys, we have no way to determine what percentage of those diagnoses may have been vaccine related. However, there is no question that the DOJ attorneys actively engaged in the fraudulent suppression of scientific and medical evidence and their actions have resulted in continuing catastrophic consequences to a generation of children around the globe and incalculable and ruinous loss to our national health system. It would be difficult to name a more consequential and catastrophic deception in the annals of human history. After the petitioners in the Omnibus Autism Proceeding lost in vaccine court, they had finally exhausted all remedies under the Vaccine Act and fulfilled the procedural requirements of the Vaccine Act. The path was finally open for the vaccine autism lawsuits to proceed to State and Federal Court. It was at this point that the Supreme Court of the United States, in its March 2011 decision in Bruesewitz v. Wyeth, interpreted a separate provision of the Vaccine Act to shield the vaccine industry from liability for injuries caused by vaccine design defects. At the heart of the Supreme Court’s Bruesewitz decision, its 2011 decision that effectively bars almost every vaccine injured child from applying for remedies for their harms from any civil court, is the DOJ and HHS deception in Hazlehurst v. HHS. Although Bruesewitz was not an Omnibus Autism Proceeding case, it is clear from the official briefs to the court as well as oral argument that the central concern of Bruesewitz was whether or not the “losers in vaccine court” and specifically the 5,400 cases in the OAP would be allowed to proceed to courts of law. The specific issue before the Supreme Court in Bruesewitz was “whether a preemption provision enacted in the National Childhood Vaccine Injury Act of 1986 bars state law design defect claims against vaccine manufacturers.” The Court’s decision hinges on the interpretation of statutory language the Supreme Court would describe as “ambiguous,” “confusing,” “sloppy” drafting. The dissenting opinion written by Justice Sotomayor and joined by Justice Ginsberg explains, that, because the statute’s language was so obscure, the majority based the court’s opinion on public policy. The majority rooted its decision on two policy assumptions; its fear of overwhelming the judicial system with vaccine cases and its faith in the administrative process and the expert scientific opinions that exonerated vaccines as a culprit in the exploding autism epidemic. The second policy implication is the Justices’ belief that the “expert opinion” at HHS would achieve a better result for public health than a rash of jury decisions. The most dramatic example of how Hazlehurst v. HHS and the decisions in vaccine court directly influenced the Supreme Court can be seen in the transcripts of the oral argument before the Supreme Court, and the written concurring opinion of Justice Breyer. As Justice Sotomayor explained “Justice Breyer’s separate concurrence is even more explicitly policy driven, reflecting his own preference for the “more expert judgment” of federal agencies over the “less expert” judgment of juries. In essence, Justice Breyer changes his mind as to the meaning of the words in the Vaccine Act based upon the opinions expressed in the briefs of HHS, Pfizer, American Academy of Pediatrics (AAP), GlaxoSmithKline, Merck and Sanofi Pasteur, all of which cite and rely heavily upon the OAP and Hazlehurst v. HHS. The “federal agencies” which Justice Breyer is referring to are all branches of HHS. The Secretary of HHS is the defendant in the Vaccine Injury Compensation Program and the Omnibus Autism Proceeding. The “expert medical opinion” is reflected in the briefs in support of the Respondent. Each of the briefs of HHS, Pfizer, AAP, GlaxoSmithKline, Merck and Sanofi Pasteur, directly rely upon the decisions by the vaccine court and the affirming decisions by the United States Court of Appeals for the D.C. Circuit in Hazlehurst vs. HHS. See attached collective exhibits 9 and 10. Justice Breyer seemed unaware of the political conflict arising from the fact that the Secretary of HHS is the defendant in the Vaccine Injury Compensation Program and the Omnibus Autism Proceeding. At that time, neither Justice Breyer nor any of the other justices had reason to know that HHS was not acting in good faith and had, in fact, defrauded the courts. The court had no way of knowing that Poling v. HHS would have been a test case and the DOJ attorney’s concealing critical material evidence and misleading the special masters and the U.S. Court of Appeals as to the opinions of Dr. Zimmerman, Dr. Kelley and other top experts was not yet known. HHS was effectively lying to the Supreme Court about Zimmerman’s “expert medical opinion” and the state of medical science. The Supreme Court majority bases its decision on the premise of a “quid pro quo” whereby the vaccine manufacturers are granted protection from liability in exchange for a government program to compensate vaccine injured children “quickly, easily” and “generously.” The “quid pro quo” is a false premise because HHS and DOJ have purposefully corrupted the vaccine injury compensation program to fraudulently prevent compensation to large classes of vaccine damaged children. “The provisions for federal agency improvement of vaccine design, and for federally prescribed compensation, once again suggest that section 300aa-22(b)(1)’s silence regarding design-defect liability was not inadvertent. It instead reflects a sensible choice to leave complex epidemiological judgments about vaccine design to the FDA and the National Vaccine Program rather than juries. Justice Scalia had no idea at that time that the government’s epidemiological judgments were the work of Dr. William Thompson (whistleblower) who has confessed to having committed fraud, Dr. Thorsen who the DOJ subsequently indicted for stealing $1 million of vaccine autism research funds, and Thomas Verstraeten, who has disavowed CDC’s characterization of his own study. At the time the Supreme Court decided this issue, Dr. Thorsen had not yet been indicted, Dr. Thompson had not yet come forward as a whistleblower and the myriad irregularities of the Verstraeten study were still a well-kept secret. The highly unethical conduct by the DOJ and HHS co-conspirators directly influenced the Supreme Court of the United States decision in Bruesewitz v. Wyeth and directly affects every child in this country today. The Supreme Court’s 2011 decision, rooted largely in the corrupted HHS science and corrupted judicial process effectively removed American citizens’ 7th Amendment right to litigate vaccine injuries in a court of law. Matanoski and Ricciardella’s scheme to defraud the OAP special master and the appellate court effectively deprived millions of grievously injured American citizens of the constitutional right to jury trial and redress. Given the critical importance of our children’s health and the far-reaching implications of these machinations, we are requesting a meeting with you and your senior staff to discuss next steps and possible hearings. We look forward to working with you and showing you the evidence. Please contact us through the Executive Director of Children’s Health Defense, Lyn Redwood, at your earliest convenience. She can be reached at 202-810-2816 or via email. Attached as exhibit 2 is the O.A.P. order entitled LIST OF POTENTIAL TEST CASES FOR MAY 2008 HEARINGS. The “ORDER Modifying Schedule for PSC’s ‘Second Theory’ Cases.” The e-mail from Tom Powers, the lead trial attorney for the PSC to the Special Masters attached to the order confirms that the Petitioner’s Steering Committee intended to designate Poling as one of the remaining three test cases if HHS had not conceded the case.